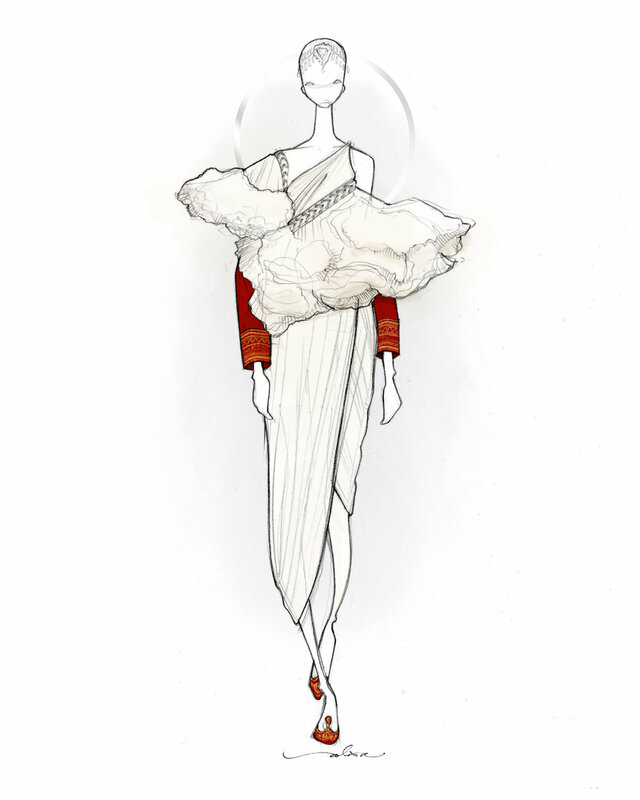 CUCFS, Cambridge University's largest independent philanthropic event, commissioned a series of illustrations to be included in a silent auction during their annual fashion show. The 2017 show focused on rethinking the definition of "normal," particularly in the world of fashion where conventional beauty reigns. The brief was simply to create something that alludes to the idea that our bodies, missing a limb or not, are equally beautiful. I chose to illustrate looks from mainstream lines, as adaptive individuals shouldn't be forced to look elsewhere for fashion or otherwise be separated as "other." Instead, fashion ought to protect, empower, and elevate. With these qualities in mind, I chose an armor-inspired look (protect), a tough studded trench (empower), and a soft, regal look (elevate). The figures in these illustrations are inspired by real individuals but abstracted to allow room for interpretation and greater relatability. For example, Melanie Gaydos is recognizable by the impact alopecia has on her hair, but the figure in my illustration could also be seen as an individual undergoing chemotherapy for cancer. Similarly, the drawing of Aimee Mullins represents not only her but all other individuals with prosthetic limbs. Ultimately, my hope is that these drawings resonate broadly, in one way or another. Aimee was born with fibular hemimelia and had both legs amputated below the knee as an infant. She wears a look inspired by medieval armor that evokes both protection and strength simultaneously. Melanie was born with ectodermal dysplasia and alopecia, making her pores, teeth, nails, and bones form abnormally. She wears a soft, feminine look fit for royalty, celebrating who she is rather than obscuring it. Winnie has chronic vitiligo, making distinctive patterns on her skin. Instead of hiding her skin, she takes on the world in a classic yet badass studded trench.